Getting Creative (and Messy!) with the Creation Station! Both James and Evelyn have a keen interest in crafts, painting drawing and most of all getting messy! So when Evelyn was invited along to join in a session at the Creation Station I knew it would be something she would love! 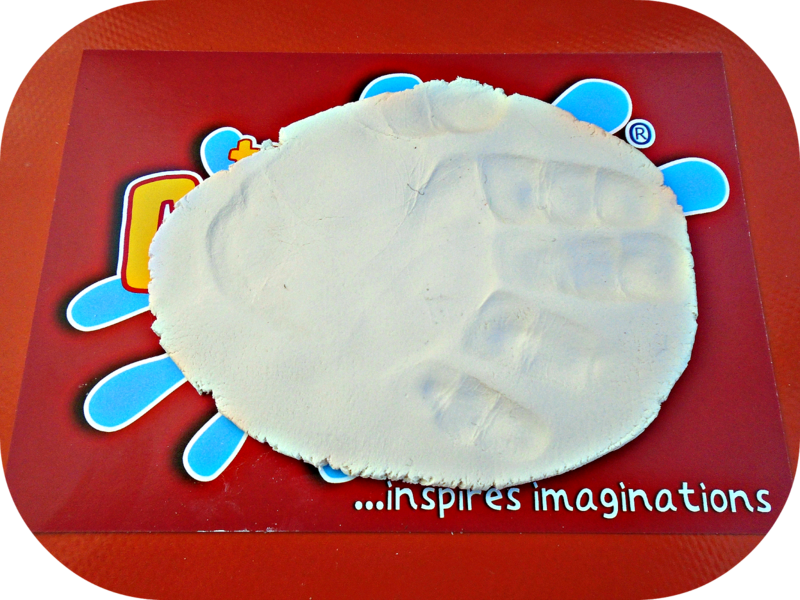 Creation Station isn’t just about learning how to paint, model or collage along the lines of “Here’s one we did earlier”. 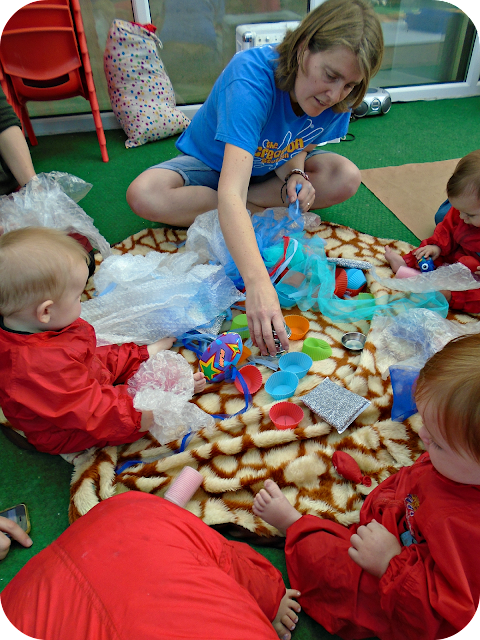 It’s about having a go, being inspired by something quite simple and encouraging each baby or child to develop their own ideas and have fun doing it! We started the session with a fun welcome song which was relaxed and upbeat and got all of the children in a circle ready for the first activity. Next Sue got out a bag full of sensory items which were placed in the middle and left out for the children to explore. Evelyn was a little wary at first but Sue was fantastic at encouraging her to join in and showing her different sensory items which eventually took her interest. 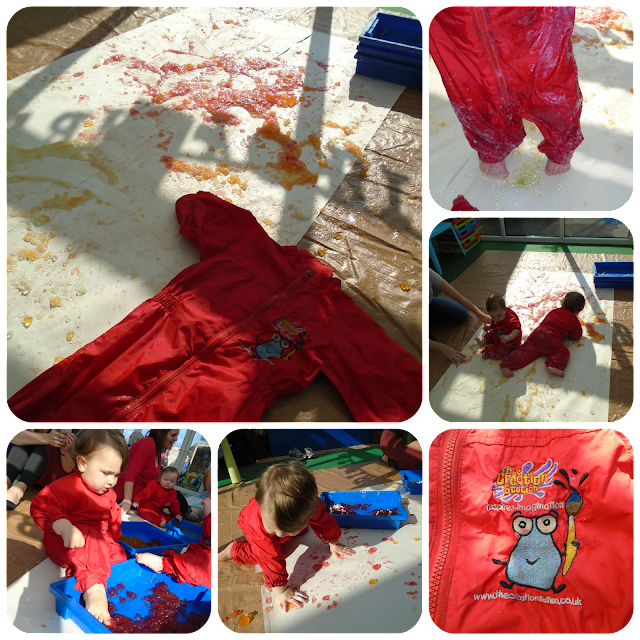 Next was the "Messy Play" activity and we were really excited to discover this week it was... JELLY!! All children are given red overalls to wear to restrict the mess on clothes although I would advice to wear your or your child's best clothes of course as mess spreads lol. The 3 tubs of different coloured/ flavoured jelly were placed in large tubs on top of paper and plastic sheeting and the children are let loose! 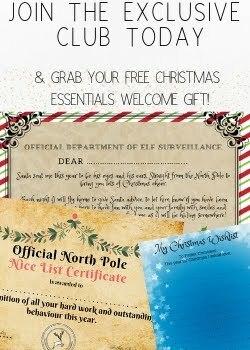 They are free to squelch their fingers in it, wriggle there toes and splat it on to the paper, the messier the better lol! Evelyn loved this activity and after sussing out what it was really got stuck in. 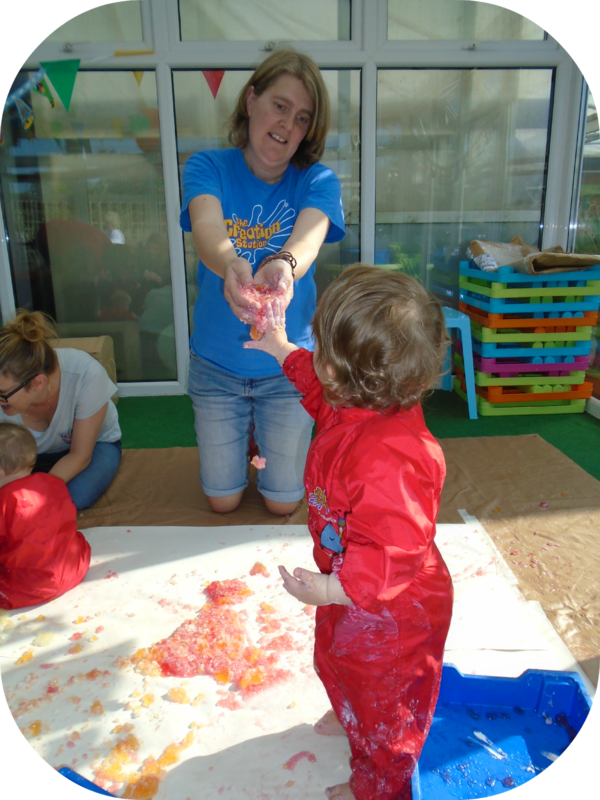 After a while Sue added white paint to the jelly giving it another texture for the children to explore, Evelyn loved running this through her fingers and Sue was amazing at showing her what to do and really getting her involved. 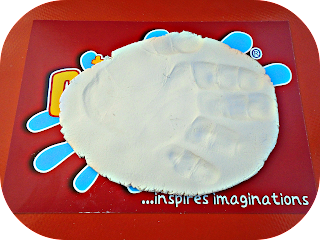 After some time playing with the jelly we all cleaned up and went on to our final activity which was making hand/ foot prints in clay to bring home. Over all both myself and Evelyn loved Creation Station, Evelyn loved the Messy Play part and I don't think she stopped smiling and giggling the whole hour. 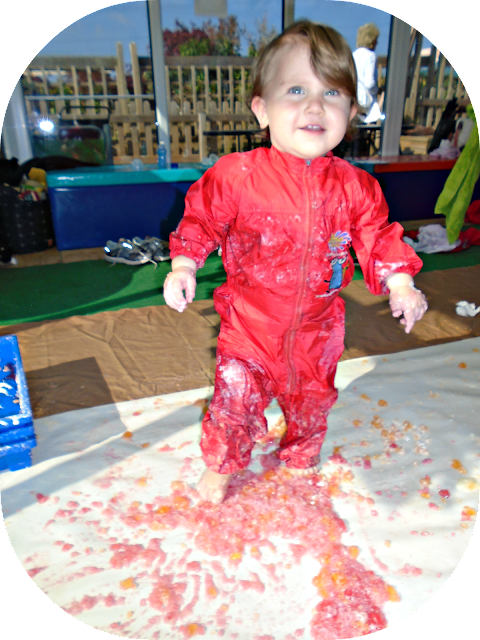 I loved the session as it gave Evelyn a chance to get really messy without any worry which can be difficult to achieve at home. Sue is fantastic with the children she really encourages the children to get involved and you can really tell the passion Sue has or these classes and the children in them. We finished the class with a goodbye song and bubbles which were a big hit with all of the children. The atmosphere throughout the class was fun, upbeat and most importantly for us relaxed. The classes were small enough that Sue really interacted with each child and you didn't feel rushed or cramped at all during the class. We loved Creation Station so much we have signed up to start classes in November and cannot wait! Sue runs creation station classes in Frampton Cotterell and the surrounding areas, as well as the weekly classes Sue also runs "special" craft sessions on certain dates such as Halloween and Christmas. 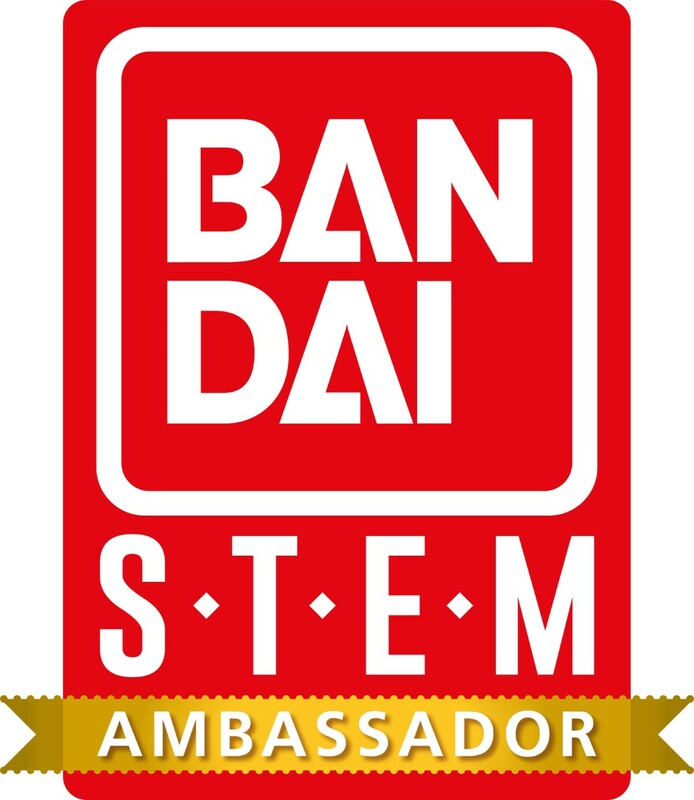 If you don't live locally check out the Creation Station website (link below) to find a class in your area. 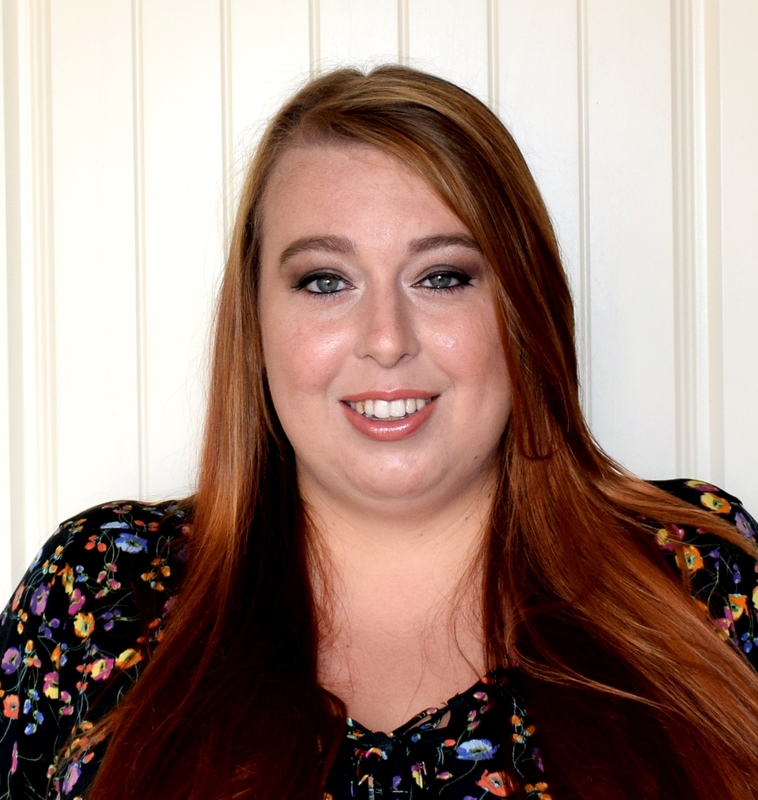 If you want to find out more about classes or the Creation Station you can visit the Website, Facebook or you can contact Sue directly HERE for any queries or questions you may have.